Throughout 2017 Christendom has been celebrating the 500th anniversary of the Reformation. October 31 marks the day that Luther hammered his ninety-five theses to the door of Wittenberg Castle Church hoping to prompt discussion and debate regarding certain practices in the church at that time. It did that, indeed, and much more. Because a wave of iconoclasm in the 16th century destroyed much religious art in Catholic churches, it is generally thought that the Protestant Reformation rejected the visual arts. It is true that large altarpieces and sculptures in churches were considered idolatrous. However, as a way to convey the new theology, another kind of altarpiece began to emerge in the Lutheran community. One of the most famous is the Wittenberg Altarpiece (1547) by Lucas Cranach the Elder, who was a close friend of Martin Luther. Often it is referred to as the Reformation Altarpiece. As part of my ongoing series of gilded altarpieces and as my tribute to the Reformation, I recently created a five-panel gold painting that echoes Cranach’s altarpiece. The distinct shape identifies this historic work and because of its luminous surface it invites the viewer to enjoy its radiance, while drawing on memory and imagination to recall the imagery that inspired the faithful. Cranach’s altarpiece was intended to reflect the Reformation’s view of Scripture. The central panel shows the Last Supper or Communion at a round table one with one of the apostles looking very much like Luther. The two side panels depict the sacraments of Baptism (left) and Confession (right). The bottom panel, which is called a predella, shows Luther preaching Christ crucified to those gathered. By placing Luther’s hand on the Bible, the work reflects the Protestant’s belief in the authority of Scripture. Sandra Bowden: Reformation Altarpiece, 2017. Reformation Altarpiece has been accepted into an exhibition titled, Sola: Grace-Faith-Scripture, at The Good Shepherd Institute, Concordia Theological Seminary, Forte Wayne IN. November 5, 2017 to January 31, 2018. 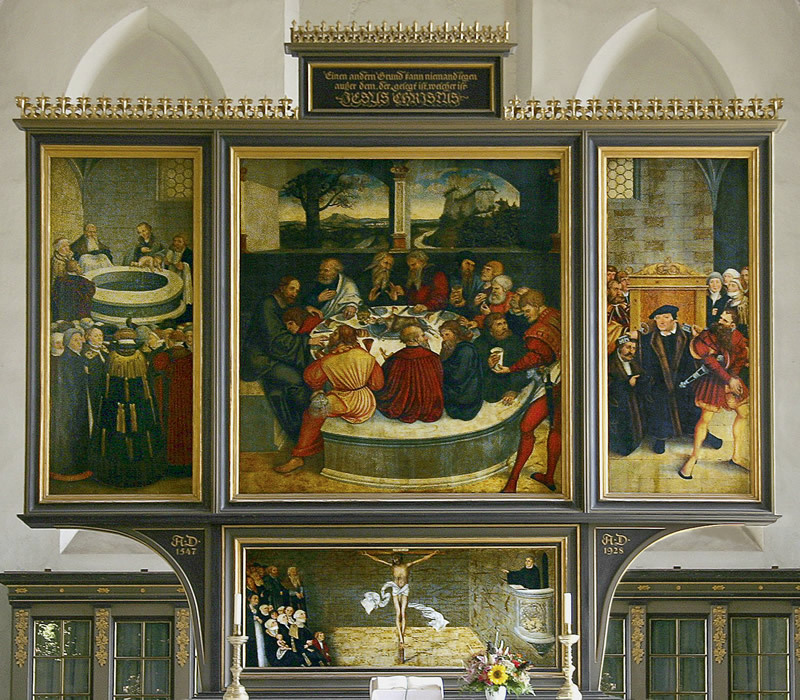 Cranach’s Reformation Altarpiece is located in the Stadtkirche/City Church in Wittenberg, Germany. Sandra Bowden is a painter and printmaker living in Chatham, MA. In 2005 Square Halo published The Art of Sandra Bowden. With over 100 one person shows, her work is in many collections including the Vatican Museum of Contemporary Religious Art, the Museum of Biblical Art, and the Haifa Museum, Israel. She is also a passionate collector of religious art dating from the early 15th century to the present. Sandra was president of Christians in the Visual Arts from 1993-2007 and has curated many exhibitions and coordinated the CIVA exhibitions program since its inception. She studied at Massachusetts College of Art and received her BA from the State University of New York. For more information go to www.sandrabowden.com.